After years of sporting variations of the pixie cut, I'm suffering through the heartbreaking process of growing my hair out. It looks quite awful, I know. I have had so few styles available to me these past months. I can let everything hang straight down, obscuring my vision, like so. I can scrape the back into a ragged little tuft, with the fringe still tumbling over my eyes, like so. Or, I can wear a headband which won't keep the shorter bits off my face for more than three minutes. It seems that British actress Carey Mulligan is enduring the awkward short-to-long hair phase right now, too. Miss Mulligan has access to hair professionals who have better styling ideas than I do: recently, she wore her overgrown pixie cut pinned up to attend an awards event. 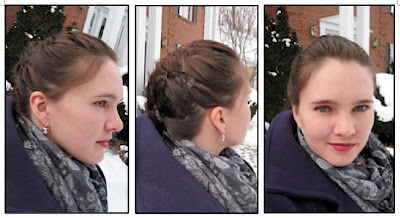 Flare Magazine declared the look to be "an elegant textured alternative to an updo". 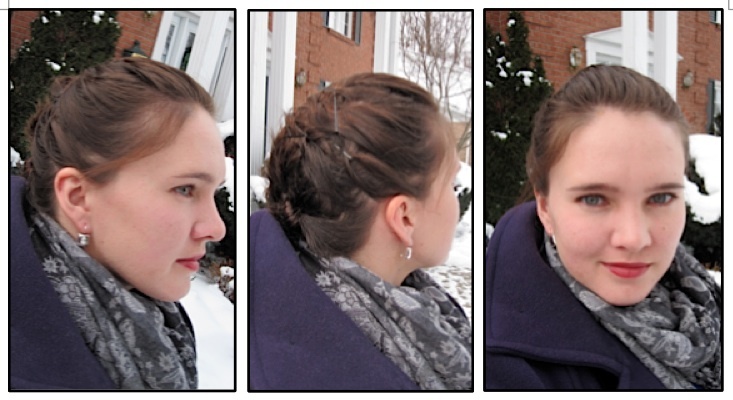 For the fancy family Christmas lunch at Langdon Hall, I tried to recreate Carey's quasi-updo. I will need some practice to get those ends neatly tucked under like the photos above, but I'm just so happy to have a different hairstyle to wear occasionally. Oh, I like options. I'm growing mine out, too, but not from a pixie cut. I am trying to get back to this from this. Right now, I have total mom hair. That looks really good. You did a great job. hopefully i can do that when i grow my pixie cut out. how did you do that? i have the same hair length you do and it doesn't tell me any where to recreate it! Well, like I wrote above, the hair is simply pinned up. I don't have directions, I just copied what I saw in Carey's photos. I pinned strands of hair to the back of my head. Not sure what else to tell you. Maybe use hairspray afterwards? Maybe twist the strands?